Before you leave be sure to check the current road conditions. Over winter, especially after snow fall, the Harrietville road can close. If this is the case it will be necessary to go via Omeo, an extra 1-1.5hrs, but this road very rarely closes. To check road conditions, call Mt. Hotham Resort Management Board. Allow 4.5 to 5 hrs if going via Harrietville, and 5.5 to 6 hours if it is necessary to go via Omeo (times based on leaving from Melbourne CBD). Don’t forget that chains must be carried to all alpine resorts over winter regardless of car type. The drive up Hotham from Harrietville is only 30 km but allow 45 – 60 min during Winter and 30-45 min during summer. It is a particularly treacherous road, subject to thick fog, black ice and extreme weather conditions, so PLEASE drive carefully! Drive through the village for about 2 km. Note the speed limit is 40 km/hr during Winter and is strictly enforced. Drive past the ‘Big D’ and ‘Jack Frost’ on the right. Trapdoor is the third lodge on the right after Jack Frost (see map below). At Omeo take the turnoff to Dinner Plain and Mt Hotham. Once you reach Hotham, you will pass a Plant Depot on the left hand side of the road. Shortly after this you should see lodges on the left. 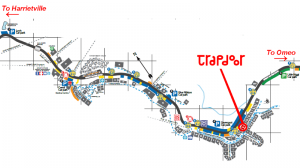 See the map below to help you find Trapdoor. You may park your car temporarily on either side of the road while unloading, but you can not leave it there overnight. You can no longer park overnight out the front of the lodge. Overnight parking starts about 300m past Bus Stop 8 (Langi Taan lodge) about 500m down the road from the lodge (towards Dinner Plain) on the right hand side. A free shuttle bus runs very regularly until about 2 am on Friday, Saturday and Sunday nights, and will come and pick you up once you have parked your car. At other times, flag down a bus prior to parking your car and let them know that you are going to the overnight car park. The bus will either follow you down or organise for another bus to pick you up. There are two entrances to the lodge. Both may be used, and both have the same key-code for entry. The green door is best to use if you are staying in Rooms 1-5 in Section A, whilst the orange door is the best entrance to use if you are staying in Rooms 6, 7 or 8 in Section B.